F.A.T. took it to the next level, combining a couple of their projects for the Cinekid festival. 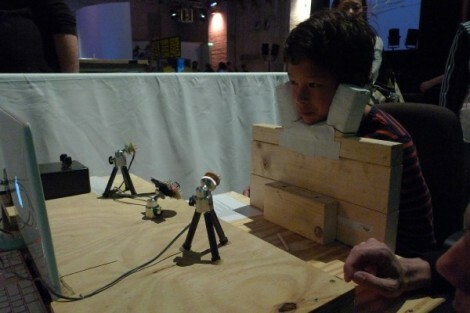 This contraption lets kids write their names with their eyes for printing by a robot arm. The first part is a glasses-free version of the EyeWriter, originally developed as an assistive technology. The system uses some IR LEDs to generate a reflection on your eye that a PS3 camera can pick up and use to precisely track your gaze. Just look at each key on a virtual keyboard to spell out your message. From there, a robot arm used previously in the Robotagger project prints out the name on a big sheet of paper the kids can take home. This is cool, but more importantly it’s a great way to inspire the next generation of hackers and engineers. Check out the video after the break. I love the eye tracking! Nice a fancy X,Y plotter. The next generation in gaming. When people get sick of jumping around like a tool, yet still don’t want to hold a controller. i really wish people would try using dasher with eye-tracking. How comes this isn’t on the front page? dasher is great for this sort of thing. there is a not front page? Some things that appear at “first glance” to merely be entertainment and/or artistic devices can be -more. Mentioning this optical tracking project as having adaptive/assistance potentials is an understatement. For the Psych Boost that a person feeling trapped in their body could get from this unit and it’s descendants is inestimable. This is not only a credit to it’s creators- it’s emblematic of how Hackerdom can use our arts tools as a life enhancement system. Did anyone notice this article being gone last night? I completely agree in every way. However, if you actually try and use the direct map key-lingering approach yourself, you’ll soon realize that it’s a fatiguing and frustratingly slow method of text input (especially if you intend to communicate in realtime). Would it be unreasonable to think that dogs/cats other animals may be able to communicate using this method?